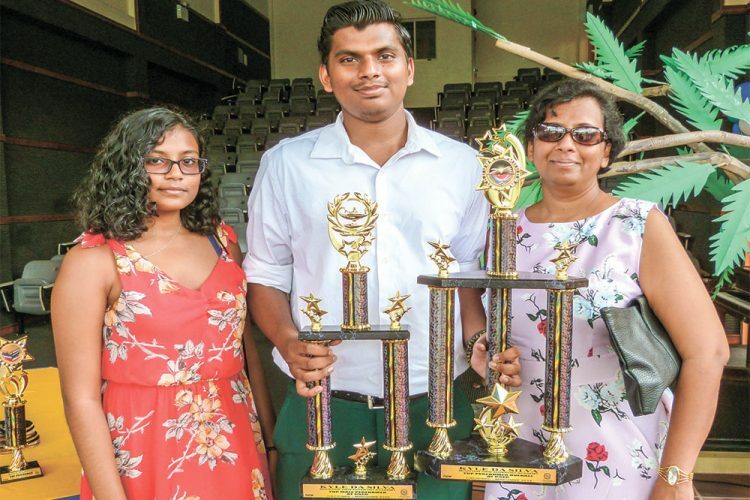 KYLE DASILVA, formerly of the Mountain View Adventist Academy (MVAA), stood at the pinnacle of the National Awards last Friday, sweeping five awards including top overall performer at CSEC. Speaking after the ceremony, which is held annually to recognize the impressive academic achievements of students who sat the Caribbean Primary Exit Assessment (CPEA), and the Caribbean Secondary Education Certificate (CSEC), the relaxed student said he never expected any of it. DaSilva was accompanied by his mother, Rhonda Sutherland, and his sister, Kristy DaSilva, who watched under the auditorium of the St Vincent and the Grenadines Community College (SVGCC), as he received awards for top performer at his secondary school, top performer in business and in science, top male performer at CSEC and finally, top performer at CSEC. The former MVAA student received 16 subjects, with 15 grade ones and a grade two in additional mathematics. Sutherland said she was very, very proud of her son, and his dad, too, would have been there with them had he not been in the United States receiving medical treatment for cancer. However, DaSilva’s dad was looking at the ceremony over Facebook live. The popular SVGCC student received strong cheers as his citation was read during his award for top performer, and he continued to receive congratulations from students afterwards. He is said to have many hobbies, and has a business mind. “Kyle is a business man, he started his own business, whilst he was still in form four producing survival bracelets, and I am sure many students by now, at the Community College, would have their own,” his former principal revealed. However, DaSilva was surprised that business was one of the awards that he received, given that he had to learn two business subjects very close to the exam. DaSilva, who is studying Physics, Chemistry, Biology, Geography and Communication Studies, is not sure what career he wants to pursue, but is leaning towards medicine. 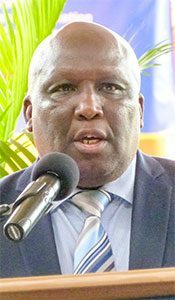 The awards ceremony was facilitated by FLOW and the Ministry of Education, and the Minister of Education St Clair ‘Jimmy’ Prince, spoke to the students in attendance. Notably, he addressed the students who performed well after remediation. 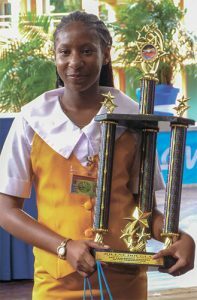 Of the many students who found success after remediation, Jolene Douglas of the St Joseph’s Convent Marriaqua was at the top. She was successful in nine CSEC subjects. Douglas had attended the Kingstown Preparatory School, but in grade six, she was said to have lost focus, and therefore was not able to attend the school of her choice. “This was a blow to her self-esteem, but it also fired her determination to succeed. In 2015, Jolene transferred into form three at St Joseph’s Convent Marriaqua, where she was to follow in the footsteps of her two older sisters, who had set such high standards,” the Principal of St Joseph’s Convent Marriaqua, Sister Jacintha Wallace said, in reading her citation. Her (Douglas’) confidence grew as she settled into her new environment and joined many clubs, and finally becoming a prefect when she was in form four. “Having passed all nine subjects, attaining seven grade twos, and two grade threes, Jolene knew she could now stand shoulder to shoulder with her two older sisters, and that she had made her indefatigable mom ever so proud,” the principal said. 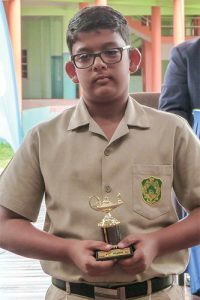 Awards were also handed out to the top 10 performers at the CPEA exam, for which Christian Gieowarsingh from the Kingstown Preparatory came first. The top male performer after remediation was Ryan James of the MVAA. The top female performer at CSEC was Kelcey Allen of the Girls’ High School (GHS), who got 13 grade one passes. The top students in each subject discipline for CSEC were: Tamika Gloster from GHS for Creative Arts/Performing Arts and Physical Education and Sport; Madison Lawrence from GHS for Humanities; Delaan Nedd from the St Vincent Grammar School (SVGS) for Modern Language; Chelsea Glynn from GHS for Home Economics; and Ghonta Rawlins of Thomas Saunders Secondary School(TSSS) and Savio Davis of SVGS for Industrial Technology. The school with the best CSEC results was GHS, the school with the best results after remediation was Barrouallie Secondary School, and the school with the most improved results was Bequia Community High School.